With summer tournaments almost in full swing, we wanted to recap on the 2016 Spring Season. The Midwest had 4 spring tournaments along with All Star Nationals and Team Trials up in Washington. The University of Missouri hosted the Tiger Thawdown in Ulman, MO. That same weekend Purdue had their Spring Fest down in Hillsboro, TN. The following weekend Iowa State University held the Jayna Trotzig Memorial in Cambridge, IA. The University of Kansas hosted the Rock Chalk Classic in Lawrence, KS the first weekend of May. And to cap off the spring season and semester, Team Midwest headed up to All Star Nationals to compete for their third consecutive title in Blaine, Washington. There were 7 teams that made it down to the Tiger Thawdown. This year Milwaukee took first in the Combined Team results, with Iowa State closely trailing, and Mizzou coming in third. Milwaukee’s Women’s Team carried the team placing second in Women’s A Combined Team results, just behind Wisconsin La Crosse. Both Iowa State Men’s and Women’s teams placed third to help them to their second place finish. Mizzou’s Men’s team placed first in Men’s A Combined Team results to lead their team to their third place finish. Grant Schipper from Iowa State sealed Overall and won Jump after putting a 96 footer out on the water. Brandon Regester from Kansas took second in Overall and won Trick with 960 points. And Will Lamonica from Marquette took third after placing second in Slalom behind Thomas Baldwin and third in Trick behind Regester and Baldwin. Holly Mayek from Milwaukee won Overall after getting fourth in both Slalom and Trick, and second in Jump. Erin Vespestad from Iowa State took second and won Slalom with 2.5 buoys at 32 mph. Samantha Granec from Wisconsin La Crosse got third. There was great weather on Saturday, great skiing, and a bonfire you could see from space Saturday night. Thanks Mizzou for hosting and putting on another tournament! The same weekend down in Hillsboro Tennessee, Purdue put on the Purdue Spring Fest at Swerve Watersports. There were some solid scores posted even with it being early in the season. In Combined Team, Michigan State took first, Purdue took second, and Ohio State came in third. Michigan State’s Women’s A team, and the 2015 Regional Women’s Team Champs, swept every event and took first in the Combined Team results. Sara Condra and Brooke McMahan lead the team to their placement. Sara Condra won Jump and set a new personal best of 66 feet. She also won Slalom with 3 at 32 mph and Overall by nearly 100 points. Brooke McMahan got first in Trick and third Overall behind Condra and Lahey from Purdue. The Purdue Men’s A team took first with first place finishes in both Trick and Jump. Andrew Schmidt put out a huge jump of 146 feet and tricked 1300 to win both events. Mitchell Lee of Purdue got fourth Overall to also help lead Purdue to their finish. Great skiing as well from Tyler Miller (CIN), Zach Brannan (OHS), and Brad Eick (MST) as they went one, two, three, in Men’s A Overall. Big Thank You to the host team Purdue, Micheal Bullock, and Swerve Watesports for putting on a great event! Thirteen Midwest teams were able to make it out to the Jayna Trotzig Memorial Tournament in Cambridge, Iowa. The host team, Iowa State University, took first in Combined Team. University of Wisconsin La Crosse came in second, and the University of Wisconsin Madison closely followed. Iowa State’s Men’s team swept the tournament getting first in every event. Grant Schipper and Cody Paggen both tied for first in Slalom. Grant won Jump with a score of 121 feet and Cody Paggen got third Overall. Thomas Baldwin also helped the cyclones to their first place finish after winning Trick with 840 points. Other great performances came from Marquette skier Will Lamonica placing first in Overall and LAX skier Austin Omelia placing second. On the Women’s side Wisconsin La Crosse was able to sneak into first winning Slalom, Jump, and Combined Team. Jenny Kaldor helped lead the LAX Women by winning Overall, placing second in Trick, and first in Slalom with a huge score of 2 at 35 off. Natalie Marcus and Lauren Pugh of LAX also put up good scores to help out the team. April Simpson from Madison ended her collegiate career with a bang as well. She placed third Overall, and won Jump with a score of 55 feet. Shout out to Iowa State for putting on yet another great tournament and continuing to get great numbers and lots of pulls! The University of Kansas hosted their 2nd Annual Rock Chalk Classic this spring. 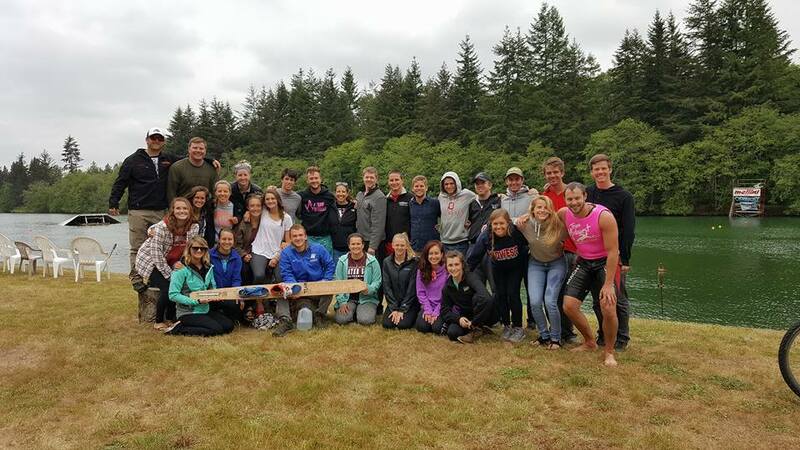 They had a great showing of Alumni to ski and compete against the collegiate teams present. The University of Kansas took first amongst the collegiate teams but fell short to the Alumni (Team America). KU skiers Dylan Brittain, Sean Kulig, and Laken Downes took top 3 in Slalom. In Jump Laken Downes and Dylan Brittain got first and second with distances of 103 feet and 91 feet. In Trick Dylan Brittain and Brandon Regester placed top two posting scores of 1800 and 960 points. Dylan Brittain was also able to take Overall. Fun Fact: this was Dylan’s first time back on the water after tearing his ACL, MCL, and separating his shoulder in the off season. Austin Doeren from Missouri State helped lead his team to a second place finish. He placed third in Jump, Trick, and Overall. On the Women’s side Katie O’Connor from KU swept the tournament. In Slalom she got ½ at 32 mph, she tricked 1260, and jumped 75 feet. Nothing like wrapping up your collegiate career with a sweep at home! Sabrina Kowalik also had a great tournament. She placed second in Trick and third in Slalom with 2 at 28 mph. This was her first ever ran pass in a tournament! Sara Condra and Nikki Weber also put up good scores getting them to the number two and three spot in Overall. Big thanks to the University of Kansas for putting on a great event (even with all the rain!) and to the Midwest Alumni that made it out and helped support! The 2016 NCWSA Collegiate All Stars was held at Borderline Lake. The top 10 Midwest skiers in each event made way up to Blaine, Washington to help Team Midwest win their third consecutive All Star Nationals. With both All Stars and Team Trials taking place at the same site, some of the best collegiate skiers in the country were present. Team Midwest ended up taking home the win! The region placed 1st in Combined Team, 1st in Jump, and 1st in Trick. For the Midwest Men, Kyle Danmeyer made the podium in Slalom with 3.5 at 35 off and placing 5th. Brandon Regester got 9th in Trick with a score of 1500 points followed by four Midwest skiers Phillipson, Brittain, Danmeyer, and Baldwin. In Jump Grant Schipper got 7th with a distance and collegiate personal best of 133. Andrew Schmidt was just behind him placing 8th with a distance of 131 feet. In Overall Dylan Brittain, and 3 time All Star Captain, placed 7th. Andrew Schmidt and Jack Phillipson tied for 9th. On the Women’s side, Jenny Kaldor placed 6th in Slalom with 2.5 at 32 off. Jenny was also the only Midwest skier to compete in Team Trials the same weekend. Riley Daulton placed 9th with 2 at 28 off. In Trick Lauren Smith made the podium placing 4th with a score of 1760. Kristen Danmeyer and Riley Daulton tied for 6th with 1360 and Abbey Bays placed 10th with 1110. In Jump, Riley Daulton made the podium and placed 2nd with a distance and personal best of 127 feet. Lauren Smith also made it on the podium with 5th place and a jump of 93 feet. Sara Condra got 7th, Kera Linn tied for 8th, and Abbey Bays got 10th. In Overall Riley Daulton took 3rd and Lauren Smith took 4th. Not too far behind was Sara Condra in 7th. On Saturday night we had 5 Midwest Men skiers compete under the lights in the Borderline Night Jump. Grant Schipper placed highest of the Midwest men. He got 7th place and booted a 139 foot jump and personal best. Overall there was great skiing and scores posted up in Washington. Congrats to all the skiers that qualified to represent the region. Nothing like wrapping up the spring season with a third consecutive All Star win! Hope everyone has a safe summer and gets lots of time on the water! See you all next fall! 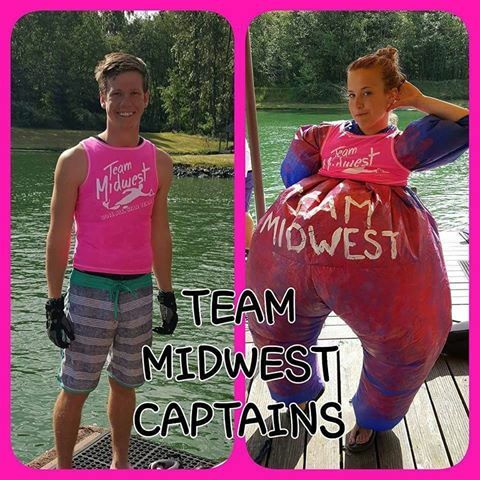 TEAM MIDWEST. YOU KNOW THE REST!